C. M. Surrisi has a BFA, a JD, and an MFA from Vermont College of Fine Arts in Writing for Children and Young Adults. Along with her husband, and two dogs she lives in St. Paul, MN. She is represented by Wernick and Pratt Literary Agency. 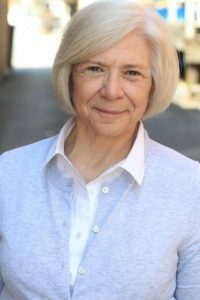 She is a member of Mystery Writers of America, Sisters in Crime, SCBWI, Women’s National Book Association, National League of American pen Women, and the Author’s Guild. 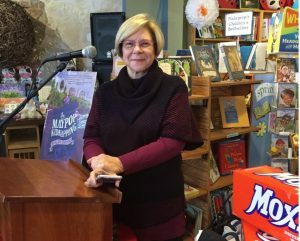 Cynthia Surrisi, who has stopped by to answer some questions about her terrific new middle grade novel: The Maypop Kidnapping, just published by Carolrhoda Books. 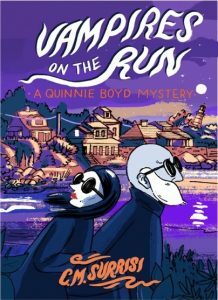 From the publisher: In the coastal village of Maiden Rock, Maine, Quinnie Boyd’s teacher has disappeared. Quinnie thinks it’s a kidnapping case, but her mom, the town sheriff, just thinks the teacher has left town. Still, Quinnie’s going to follow her instincts that something’s wrong. 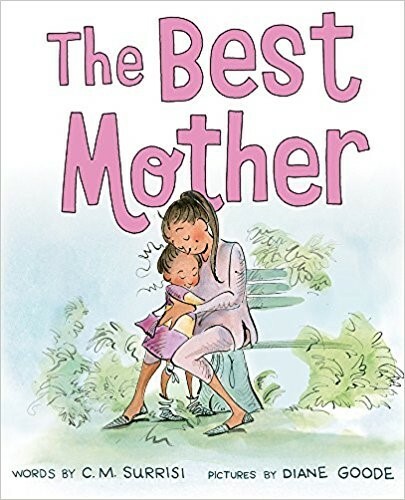 AND…..you can win a signed copy! Just leave your name and email address in the comments. Winner will be drawn March 21. Why did you choose to write a mystery for your first book? I have been a mystery reader since childhood. I read every mystery that was available to me, which included all of the Nancy Drew and Hardy Boys series. I had a friend in 4th grade (I’ve blocked out her name and you’ll see why) who owned all of them, but she would only loan them to me one at a time and only for one overnight each. Mean, huh? That meant I had to read them under the covers with a flashlight. In retrospect, it enhanced the spookiness of the stories and certainly kept my pulse racing. There was no question as to whether I would turn the next page. As a result, I was really tired a lot in 4th and 5th grade, but the rhythm of a mystery became central to my reading experience. Do you find there is anything unique about writing a mystery? Starting in 4th grade, I crafted my own series in spiral bound notebooks. It was called The Twins of Cherrystone Farm. Wow, were those two sisters meanies to each other, but they stuck together when it counted. They solved the mysteries of the stolen gym socks, scandalous unsigned notes, angry valentines, and tons of other middle grade drama of the time. They were filled with tons of spooky suspicions that never went anywhere. For good or ill, they are long lost. It wasn’t until I got to my MFA program years later and had an adviser who was an experienced mystery writer that I learned that you don’t write a mystery from the perspective of a reader. Meaning, you don’t just start and lay down all kinds of fun and intriguing things with no clear idea of how you will tie them all together. It’s too easy to plant then lose track of clues. Chekhov said it best: One must never place a loaded rifle on the stage if it isn’t going to go off. It’s wrong to make promises you don’t mean to keep. So now, for me, mystery writing requires a very detailed plan. I have written four of them, and while I allow myself a lot of freedom in the actual story narrative, I plan out the mystery in a treatment. I write the backstory, then the opening, then the big reveal. This way I know where I’m going. And I keep track of the clues and red herrings in a chart. The blurb on the cover of your book says: The only thing that would make this book better is if it came with a Gusty Burger and a side order of lobster fries. I’ve never flown through a book so fast to find out whodunit. What exactly are Gusty Burgers and lobster fries, and is this a foodie book? Protagonist Quinnie Boyd’s father owns Gusty’s cafe. And yes, the cafe is central to the setting. In the book, everybody’s eating and arguing over what they like and don’t like. A teeny off-season town needs a little commerce. In this case, it’s the lobster pound, the cafe and the real estate office. The really special and delish dish at Gusty’s are the Lobster Fries. These are crispy French fries served with a side of a melted butter, lemon and saffron sauce to dip them in. I’m leaving out the super secret ingredient. The locals love them and the summer people go nuts for them. Aside from that, Gusty serves lobster roll on a buttered split top bun (secret recipe), clam chowda, garlicky cole slaw, blueberry pies with those little Maine blueberries, and whoopie pie sliders. Oh, and every table gets a beat up wooden bowl of Cheese Nips. What’s the story on Moxie? Don’t get me started on Moxie! Well, okay. It’s the first bottled soda in America and draws its flavor from gentian root. Originally, it was marketed as a cure-all and called Moxie Nerve Food. Moxie bottle wagons dispensed it at fairs and amusement parks all over the nation, but it really only caught on in New England, specifically Maine. The company’s motto is “Live your life with Moxie.” Who can’t support that? I fall on the love-it side of the Moxie fence. Others, not so much. In the book, Quinnie’s mom and teacher strongly disagree on the tastiness of the local beverage. If you want to learn more about the history of this very interesting carbonated soda, click HERE. Okay, it’s time to talk about the nuns. Those two sisters in Maypop have been in the back of my mind for many years, waiting for their turn in a story. They spring from my early years in Catholic school and my six-year-old desperate plea to Santa for a nun doll. Here is the nun doll I located on Etsy to replace my long lost Sister Josephine doll. It’s like she’s never been gone. I can’t explain my fascination with nuns. Perhaps it’s because they were role models. Perhaps it’s because they were costumed. I don’t know. All I know is that I have always wondered what they might be like as fun characters, and now they exist in the book. I never wanted to be a nun, but when I was six, I did pin a scarf on my head like a veil and march imaginary children around the house telling them to hold their buddies’ hands and not dilly dally. Like I say, role models. A craft question: Do you write what you know? Writers talk about this all the time, don’t we? The question is what does know mean in this context? My work arises out of a grand mishmash of everything I have been exposed to and experienced. I create from whole cloth, often riffing off of memories of place, incidents and people. Nothing is documentary. Nothing is biographical, except to say that when I challenge a character to feel something, I draw from my personal emotional well of feelings. I go to my heart. My mom was nothing like Sheriff Boyd, but I’ve had mother-daughter conflicts. I know what that tension feels like, how it can ache and how it can challenge a tender young soul. You moved to North Carolina recently from Hawaii. What have you found to be the biggest difference? I’m originally from Minnesota and I knew a lot of North Carolina, so I haven’t experienced any surprises. Not so with our pets. Our two dogs and cat had never experienced squirrels, turkeys, deer, cold, or snow. Watching them come face to face with Western North Carolina nature has been pretty hilarious. This is a picture on day one. They’re hyperventilating after seeing their first squirrel.